With “Neighbours'” incessant awareness campaign set to overkill, I’m not sure there are many who don’t know the film’s plot and selling points. Nonetheless, for those of you who have been fortunate enough to escape the film’s black hole of mediocrity, you’ve managed to save a significant amount of hilarity for the actually viewing of the film, granted you view it at all. Yes, a sizeable chunk of the film’s most memorable, hilarious scenes are plastered all over the internet and television for free, so enjoy. Now, essentially “Neighbours” is a tale of two childish, unfulfilled men at different stages in their lives trying to prevail and dominate over the other. Yes, that’s the premise and yes, it is as immature in its delivery as it is script-wise. In layman’s terms, a frat somehow manages to move into a quiet neighbourhood and soon is at war with their new neighbours. 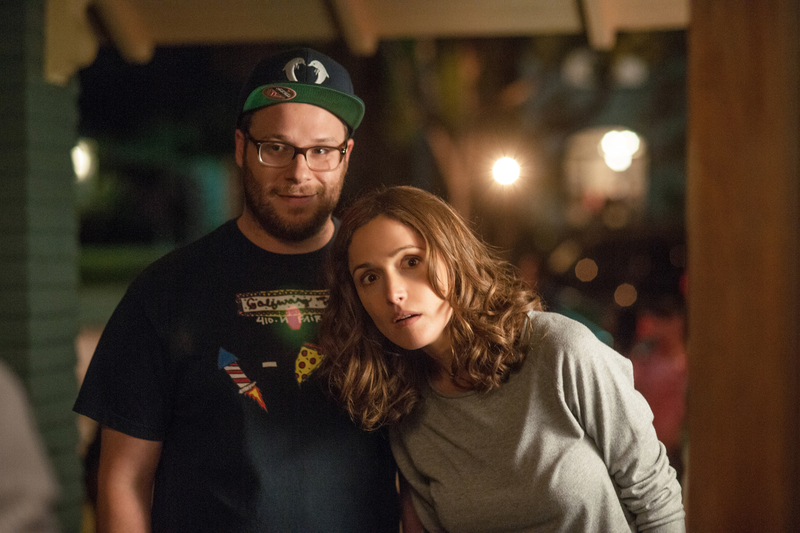 Directed by Nicholas Stoller (Forgetting Sarah Marshall, Get Him to the Greek), and starring, apart from Seth Rogen, the lovely and immensely talented Rose Byrne, Zac Efron, and Dave Franco, “Neighbours,” on paper, should have been a laugh riot, not a measly chuckle and whimper. Apart from a few laughs, the film offers nothing of value cinematically. I’m sure the ladies will get a kick out of Efron shirtless, hell, even the male section of the film’s audience will see more of Rose Byrne than preferred, but these aren’t exactly facets to be proud of. I do assume it’s a positive that Rogen hasn’t been this effective in a while and that Efron has never been so charismatic, but in all fairness, their track records aren’t exactly top-notch of late. 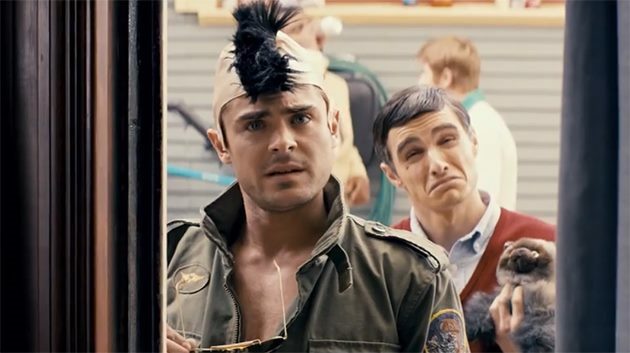 In Efron’s case, we really don’t have a resume to begin with. Byrne is as beautiful and entrancing as ever, but the vulgar humour doesn’t fit her well. Not surprisingly, the underrated Dave Franco truly steals the show here with his comedic prowess and impeccable impression of Robert De Niro. Look, It’s not that I’m pretentious or hate laughter, far from it. I simply prefer subtle, intelligent, timely, sympathetic, relatable humour rather than an alternative that consists of the raunchy, idiotic, unfathomable approach of modern comedy, you know what I’m talking about, films like “Neighbours” or Adam Sandler abortions. I know that sounds conceded, even ostentatious, but honest to god that’s my preference. However, that doesn’t mean I don’t appreciate the dirty, unflinching, harsh, truthful approach of today’s comedians. It’s just, I find that humour occurs so naturally and fluidly that it is nearly impossible to capture true hilarity on demand for the sake of cinema. Additionally, where films of other genres rely on dialogue, performances, story, direction, cinematography, music, etc…comedy films, for the majority, solely depend on the appeal and material of its leading cast members, and “Neighbours” doesn’t meet any of the aforementioned criteria wholeheartedly. It’s extremely hard for me to write-up a post regarding comedy as I’m sure you can tell by the incoherence and simplicity of this article, not to mention the uncomfortable feeling that washed over you as it continued, so I’ll just end it. “Neighbours” is about as good as purely comedic films get nowadays, sadly. Without much stimulation and an abundance of unintelligent humour, I can guarantee this film will be a distant memory in the not too distant future. I might be a little to bias and it seems as if I’m having a little too much fun ripping comedy apart. If it’s any consolation, the film is watchable and consistently has your attention, which is a huge bonus when considering the state of current comedy films. It might not be as bad as I’m making it seem, but not by much. Neighbours: 6 out of 10. Posted on May 8, 2014, in Comedy and tagged Byrne, Comedy, Dave Franco, Efron, Rogen, Stoller. Bookmark the permalink. 27 Comments. I’m so pleased to now know some one who dislikes comedy films as much as I do! I’m also quite relieved that I’m not alone :). Should be a good date night film :). This was where I expected reviews to sit, in the mediocre range. Seen a couple of positive reviews but just doesn’t look up to much to me. Nice review buddy. Thanks! Yeah, it’s really nothing special, but it’s got some decent moments. I’ve really gone off comedy films in recent years – at least, new releases. (I tend to go for the oldies to get a chuckle). One of the main problems I find with comedy is that it’s really not all that cinematic. You go to the cinema to see an action film and there are explosions, a drama evokes emotive tendencies, sci-fi offers grand visualities etc. Comedy is often very cheap (though not always, Calvary being a great example) which I think complies with what you’re saying. Haven’t seen this, but don’t really have the urge to. And that’s the problem. Top review mate! Love this statement! Especially the last few lines regarding a lack of urgency and excitement to see comedy films now a days. Thanks for reading :). Another good review, yes come on Joseph just laugh dammit! Well I guess with a movie like this you cant expect much other than to get a good laugh and if this doesn’t manage that then all hope for anything else is gone. Thank you :). I did laugh throughout this flick…occasionally ;). I didn’t hold much hope for this flick cinematically, but I guess it provided a few solid laughs. Yes you can’t expect much it’s just a corny type movie. I’m absolutely with you. I love humor in films, but I tend to not care enough to watch a movie which only cares to be “funny”, usually because that goal results in a lot of cheap and recycled jokes. Maybe that is why I am in the minority in liking Rogen and Sandler in Funny People: I appreciated that it was ABOUT something. I absolutely cannot stand Adam Sandler! Maybe he’s funny in real life, I don’t really care, but yes, Funny People was one of the few films I can stand him in. I liked Sandler when I was 13. I grew up. He kept making the same movies. Haha, this statement is perfectly hilarious because it’s oh so true :). I liked how this one tried to attack the frat party scene from a different angle but the vulgar humour remains king. It doesn’t descend as far into the crude, juvenile gags as This Is The End though and for that I think it’s a much more instantly appealing movie. But as you say, utterly forgettable. Nice review Joseph. Thanks for reading!! Completely agree, although I thought This is the End was funnier than this flick, but that might have to do with my favourable opinion of Franco and company more so than Efron and company. Had such a laugh reading this – awesome review! Thanks! Thrilled I could give you a good chuckle :). Very fair mate. I suspected the trailer featured all the best bits which were amusing enough to be fair. Still intrigued to see it. Thanks :). Totally agree, disappointed the best scenes were featured in the film’s teasers and such, but they are funny nonetheless! Be sure to let me know what you think!! Bummer! Sad to hear you didn’t like this one as well, my friend. It’s not the best comedy in the world, I’ll grant you, but I thought it was a pretty decent amount of fun. 🙂 Nice review, Joseph! Thanks Cara! It is a decent amount of fun, even provides a few good laughs. I just feel that decent isn’t good enough anymore :). That’s so true, probably something that annoyed me subconsciously ;). seriously, did we need a big moral lesson in ‘Paul Blart, Mall Cop’?